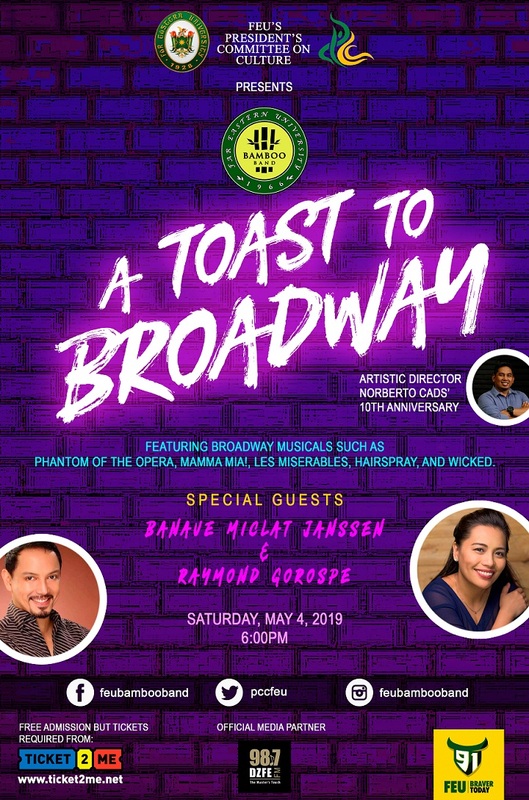 Far Eastern University President’s Committee on Culture presents the FEU Bamboo Band in a concert entitled, “A Toast to Broadway” on Saturday, May 4 at 6:00 p.m. in the historic FEU Auditorium. Known as the cultural center of the country in the 1950’s, the FEU Auditorium celebrates its 70th Anniversary throughout 2019. The FEU Bamboo Band is composed of students from the different institutes of Far Eastern University under the artistic direction of Norberto Cads, who is celebrating his 10th anniversary with FEU. Mr. Cads has extensive knowledge on bamboo music and has participated in numerous international expositions and festivals together with the Banda Kawayan Pilipinas. He trains his members in various genres of music. The culmination of a whole academic year’s worth of rehearsals taught the members masterpieces from iconic Broadway musicals. “A Toast to Broadway” features classics from Phantom of the Opera, Mamma Mia!, Wicked, and Les Miserables on bamboo instruments. The concert celebrates these enchanting hits from Broadway Musicals but also highlights the talented members of the group who are all non music majors. The concert will reinforce to the audience that theatrical music is accessible to everyone, is enjoyable and can be performed on bamboo instruments. The concert will be further electrified by two exceptional artists namely Mr. Raymond Gorospe and Ms. Banaue Miclat Janssen. Mr. Raymond Gorospe is a host, commercial model, and 2015 WCOPA (World Championships of Performing Arts) multi medallist including Silver Medals for the Gospel and Broadway Vocals Categories. Ms. Banaue Miclat Janssen is a professional performer who has won two Aliw Awards for Best Performance for a New Concept Production, most recently for her performance in Ginugunita Kita in the FEU Auditorium, the Best Actress Award from the Metropolitan Opera Getty Awards for her role in “Salome”, and a Best Actress citation for New York University’s First Run Film Festival for “Giving Care”. She is a professor in the University of the Philippines Diliman’s Department of Speech Communication and Theater Arts. She is the current Artistic Director of Dulaang Unibersidad ng Pilipinas (DUP) and the UP Playwrights’ Theatre (UPPT). “A Toast to Broadway” is a free concert that also celebrates the ninety first year of Far Eastern University. Tickets may be downloaded from www.Ticket2Me.net. For more information about the concert, FEU’s Cultural Groups and other upcoming performances, please visit and like the FEU President’s Committee on Culture Facebook Page, www.facebook.com/FEUPCC or download the FEU Cultural App.